Gold is a high-risk bet, not a safe haven. Gold has performed very strongly over the past decade, trouncing equities and bonds in the process and handing investors who own the SPDR Gold Shares (NYSE: GLD) or the iShares Gold Trust (NYSE: IAU) handsome gains. Amid a heated debate about whether gold is in a bubble, it's worth taking a historical view to examine the risk investors are taking by paying more than $1,300 for an ounce of gold. In fact, gold appears to have eked out a small positive real return over time. 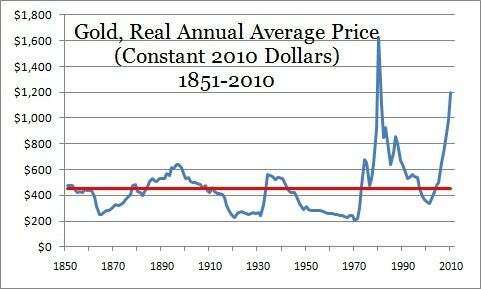 Using data from the World Gold Council and precious metal dealer Kitco, I was able to construct a series of inflation-adjusted gold prices going back to 1851, according to which gold generated a historical average return of 0.7% per annum. However, even that small positive real return is a bit of a mirage resulting from the powerful gold rally we've witnessed. 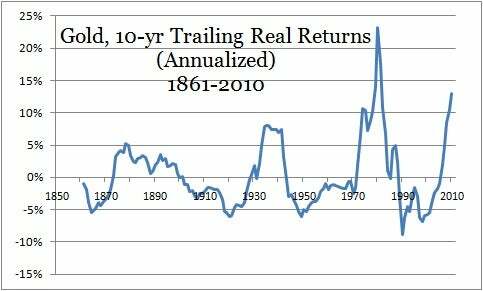 Indeed, as recently as 2005, gold's average real return over 154 years was zero, period. That shouldn't be surprising: There is no reason to expect that an inert asset that produces no cash flows and has few industrial applications to accrete value. By stating that gold has returned nothing, I'm not disparaging the yellow metal; rather, it shows that the precious metal has acted as a store of value -- over the very long term (for practical purposes, however, gold's price volatility makes it unsuitable as a store of value). That's consistent with the notion that it is an alternative currency that no government can debase. Sources: World Gold Council, Kitco. Gold returns are mean-reverting: The alternating peaks and valleys in the graph illustrate the fact that periods of higher-than-average returns tend to usher in periods of lower-than-average returns, and vice-versa. That's not surprising since this property shows up across different asset classes, including stocks. Investors who have owned gold over the past 10 years have earned a real return that is far in excess of the historical average. In fact, there is only prior period that witnessed higher returns: the bull market in gold that culminated in January 1980. Judging by gold's performance over the next two decades, that top capped off an enormous bubble. Gold could fall by two-thirds! Gold is galloping ahead of its historical average (the red line)! In fact, the price of gold would need to fall by almost two-thirds to get back to its long-term average of $456/ ounce, not to mention that markets typically overshoot. That's a sobering thought if you have a significant position in gold. Gold is inherently a speculative asset. Despite what I wrote above, I do believe that it represents an attractive, but high-risk, speculation, as the current supply demand dynamics look compelling. However, I can't rule out that things will turn out differently than I expect them to. If the economic recovery stabilizes and high inflation doesn't materialize, gold could decline significantly from its current level. Let me emphasize that point: At these prices gold is no safe haven; it's an active bet on a specific scenario for the U.S. economy. Super-investor John Paulson owns gold because he believes the U.S. will experience double-digit inflation, but if that doesn't pan out, the bet could prove costly. Major gold miners that have closed out their hedges, including AngloGold Ashanti (NYSE: AU), Barrick Gold (NYSE: ABX) and Gold Fields (NYSE: GFI) would share in the pain. I have been bullish on gold ever since I began looking at this market in February 2009, and I have argued against the idea that this is a bubble. As I review my thesis, I now believe it's likely that we are in bubble territory; nevertheless, I remain bullish because the conditions are in place for this bubble to continue expanding. Investors who wish to speculate on this can do so via the two ETFs I mentioned in the opening paragraph or through the following vehicles: Sprott Physical Gold Trust (NYSE: PHYS), the Central Gold Trust or the Central Fund of Canada (AMEX: CEF). If you want to bet on gold, there are smarter ways to do it than just buying the metal. One little-known company has discovered a mountain of gold in Canada. Get the company's name in the Motley Fool's free report, One Gold Stock Digging Up Massive Profits.